Remarkable yet less visited Via Appia Antica is a must visit while you are in Rome, it is the perfect weekend day visit with your family, it is the perfect family picnic day in Rome. The Appian Way is another reason why Rome cannot be visited in 3 days! For us romans the Appian Way is simply the “gran classico”, we all take our kids biking there to experience in total freedom far away from mass tourism the ancient beauties of the Roman Empire. We pack our packs our backpacks full of great foodies for the day and off you cycle on a long day excursion (this day trip is not advised if your kids are very small and cannot cycle properly). 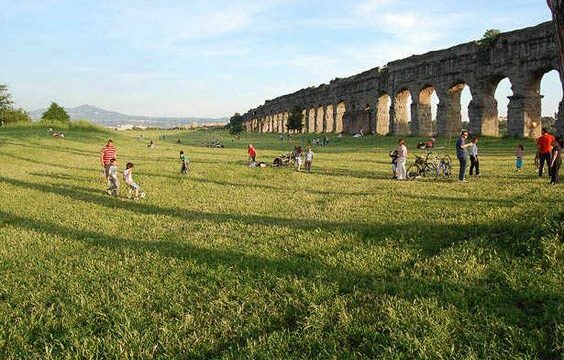 It is truly “stupendo” and the Appian way is full of perfect family picnic spots. We have chosen the perfect family picnic spot for you and if you really want to surprise your friends with a luxury picnic after riding your bicycles for a few miles you will “tumble” on to our beautiful picnic linen mats with cold champagne waiting for you, chose our luxury picnic option with a brunch with friends formula. 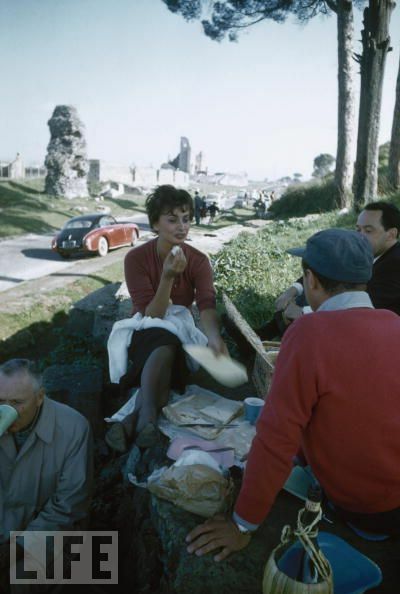 I found this beautiful photo of Sofia Loren picnic on a weekend in Rome on the Appian Way. 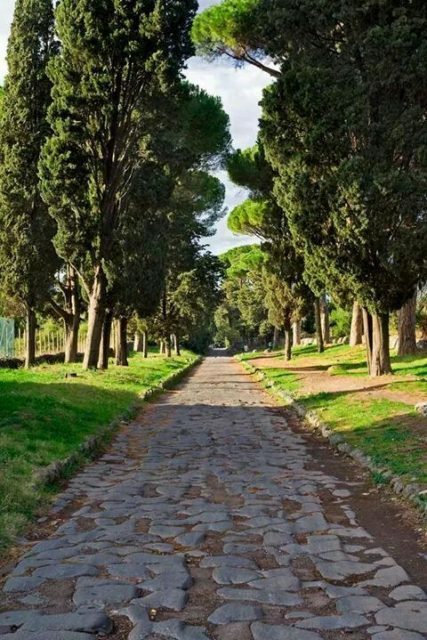 The Appian Way was once the world’s most important road. It was the widest and largest road of its time and the most famous of all the roads that radiated from Rome towards the far ends of the Roman Empire. It was called the “Regina Viarum”, or “queen of roads” and was the reason for the famous saying “all roads lead to Rome”. The road today is remarkably well preserved, flanked on both sides by fields punctuated with monumental ruins and other vestiges of Roman and Christian history. Below the road there are miles of tunnels known as Catacombs, where the early Christians and Jews buried their dead. On Sundays, the Appian Way is a car-free zone, making it an ideal place to picnic during a lazy sunday in Rome and why not plan ahead and book our picnic delivery service! The park, which is around 3400 hectares, has been a protected area since November 10, 1988. Because the area is too huge for a day walking trip, I strongly suggest to rent a bicycle in the tourist information point at the beginning of the Appian Way . Caffarella Valley A truly unique spot with a strange and authentic atmosphere, the Valley of the Caffarella is a timeless stretch of land. This is a perfect spot of a family roman picnic, truly amazing. The grass smells of “menta selvatica”, this is the mint romans use in their carciofi alla romana (famous artichokes in rome). It is a protected public park, and is home to many species of birds and animals which have vanished from much of the remaining Roman countryside. There is a wild feeling about the terrain, parts of which are still used for agricultural purposes, and you may encounter flocks of sheep, guarded by shaggy white dogs. You can be able to reach the park either through Coli Albani metro stop or through Subaigusta metro stop. You may likewise catch the Archeobus to get to the park. Archeobus departs from Termini to Via Appia Antica simultaneously every 40 minutes. The Road is named after Appius Claudius, the Roman censor who began and completed the first section as a military road to the south in 312 BC and was constructed in order to make a fast and reliable communication between Rome and Capua (towards Napoli). The whole distance of the original road was 132 miles and it took 5-6 days to make the trip. The first stretch was a straight 30 mile line between Rome and Terracina, with the last 10 miles being flanked by an artificial canal that allowed the weight to be put on small boats. The road was lengthened several times until arriving to Brindisi on the Adriatic coast, where boats left for Egypt, Greece, and North Africa. It took about 13 days to complete the 365 miles journey. The Appian Way was revolutionary for the time. The “basoli” surface was said to have been so smooth that you could not distinguish the joints. The roads width was 4.15 meters, wide enough to allow two chariots to pass in an opposite direction. The road was crested in the middle for water runoff, and had ditches on either side of the road, protected by retainings walls . Since it was forbidden to bury the dead inside the city, many were buried along the roads leading out of Rome. Important people built impressive tombs for themselves or for their whole family. Even Roman emperors were buried here. In 73 BC, a slave revolt under the ex-gladiator, Spartacus, began against the Romans. Spartacus defeated many Roman armies in a conflict that lasted for over two years. While trying to escape, Spartacus moved his forces into the historic trap in Apulia/Calabria where he was pinned between Legions that were brought from all over the Empire. On his defeat the Romans judged that the slaves had forfeited their right to live. In 71 BC, 6,000 people including Spartacus were crucified along the 200-kilometer Appian Way from Rome to Capua. While the Appian Way is lined with monuments and tombs of ancient Roman patrician families, many find what’s under the Appian Way to be more interesting. Below the street are miles of tunnels – known as catacombs – where early Christians buried their dead and, during the worst times of persecution, held church services discreetly out of the public eye. Mile after mile of musty-smelling tunnels whose soft walls are gouged out with tens of thousands of burial niches (long shelves made for 2-3 bodies each) can be seen in the famous Catacomb of Callixtus and catacomb of St Sebastian. On Sundays, the Appian Way is a car-free zone, making it an ideal place for our Appian Way day tour and why not plan also a great picnic delivery! Romantic Picnic in rome, is it a good idea for a first date?